There’s a fight at the CHI Health Center in Omaha showing live at 10:30 on ESPN5 this morning (Manila time) and it’s a must-watch. It isn’t just about a battle between two undefeated boxers. It’s also about a struggle for survival, featuring two victims of gun violence, both nearly losing their lives now on the global stage to show their insensitivity to adversity. 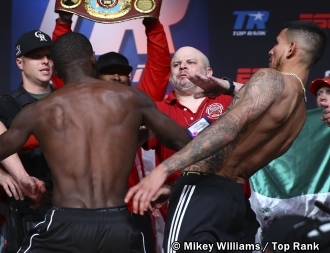 WBO welterweight champion Terence (Bud) Crawford, 31, is making the first defense of his title against Jose (Merciless) Benavidez, Jr., 26, in a duel that’s guaranteed to be a humdinger because neither considers losing an option. In 2008, Crawford was shot in the driver’s seat of a parked 1986 Pontiac in an Omaha street corner at 1:34 in the morning while counting the money he earned from a dice game. The gunman fired from the back of the car and the bullet from a 9 mm pistol penetrated the rear window to graze the back of Crawford’s head, below the ear and above the neck. Crawford was lucky that the bullet missed his skull. He drove himself to the hospital and was released five hours later after doctors sewed up his wound. Crawford was in kindergarten when his mother’s brother was stabbed to death. His father was a Navy officer and hardly cared for his family. He and two older sisters were raised by their mother Deborah who worked in a Campbell soup factory. Crawford started boxing at seven and saw in the sport a way out of poverty and misery. He went through five high schools before graduating and had a troubled life with an aunt imprisoned for cocaine possession. Eventually, Crawford straightened out. His long-time trainer Brian McIntyre was the man who guided his career. Crawford became the unified WBO/WBA/IBF/WBC superlightweight champion----only five fighters in history have been recognized by the four governing bodies in any division----then stopped Jeff Horn in the ninth round to capture the WBO welterweight title. Crawford worked hard to get to where he is and he’s not about to let Benavidez take away his place in the sun. Crawford now has five children to care for, four with his girlfriend Esha and a stepdaughter. A switch-hitter, Crawford is known as the second coming of Floyd Mayweather, Jr. He’s shifty, crafty and cunning. He also has knockout power, racking up 24 abbreviated wins in a 33-0 record. But he’s up against a tough challenger, Benavidez who at 6-2, is six inches taller with a three-inch reach advantage. Benavidez has a 27-0 record, with 18 KOs. He, too, has worked hard to get to where he is. Only two years ago, Benavidez was shot twice by a gunman while walking his Schnauzer dog and an expensive cat. One bullet struck the femoral artery and shattered his femur in the right leg. The other slightly hit the pinky of his right hand. Benavidez was left for dead, bleeding profusely. He was brought to the hospital for surgery and a metal plate with screws was inserted in his knee. Doctors said his boxing career was over and he wouldn’t be able to walk for two years. But in a remarkable recovery, Benavidez was back in the ring after 18 months. Benavidez’ father Jose, Sr. taught him how to box at six. Jose, Sr. migrated to the US from Mexico and took to stealing radios from cars and selling drugs until settling down with a real job as a dishwasher in a hotel. With sons Jose, Jr. and David, he thought of boxing as their way out. Jose, Sr. studied film of Tito Trinidad, Oscar de la Hoya, Julio Cesar Chavez and Naseem Hamed, learned from their fights and taught his sons how to be like them. Jose, Sr. apprenticed with Freddie Roach for four years and brought his sons to train at the Wild Card Gym. Benavidez became the youngest-ever US Golden Gloves champion and David the youngest ever WBC supermiddleweight titlist. Growing up, Benavidez honed his skills sparring with Amir Khan, Sugar Shane Mosley and Manny Pacquiao. Benavidez warmed up for Crawford by knocking out previously unbeaten Frank Rojas at 1:24 of the first round in Las Vegas last June. He could be the hardest puncher Crawford will have ever faced. Another intriguing point in this fight is Crawford and Benavidez are in Pacquiao’s weight class so it’s doubly interesting to imagine how either would match up against the WBA 147-pound champion. Postscript. The last installment of the series on unheralded players now making waves in the PBA Governors Cup will be in this Tuesday’s column. Photo: Jose Benavidez dodges a punch thrown by Terence Crawford after Benavidez pushes Crawford during Friday's weighin in Omaha, Nebraska.